Now Chong is suspended for saying Abang Johari acts like an UMNO Minister. Motion moved by TS Adenan. The sacking of Pujut assemblyman Fong Pau Teck is indeed a wake-up for DAP Sarawak. 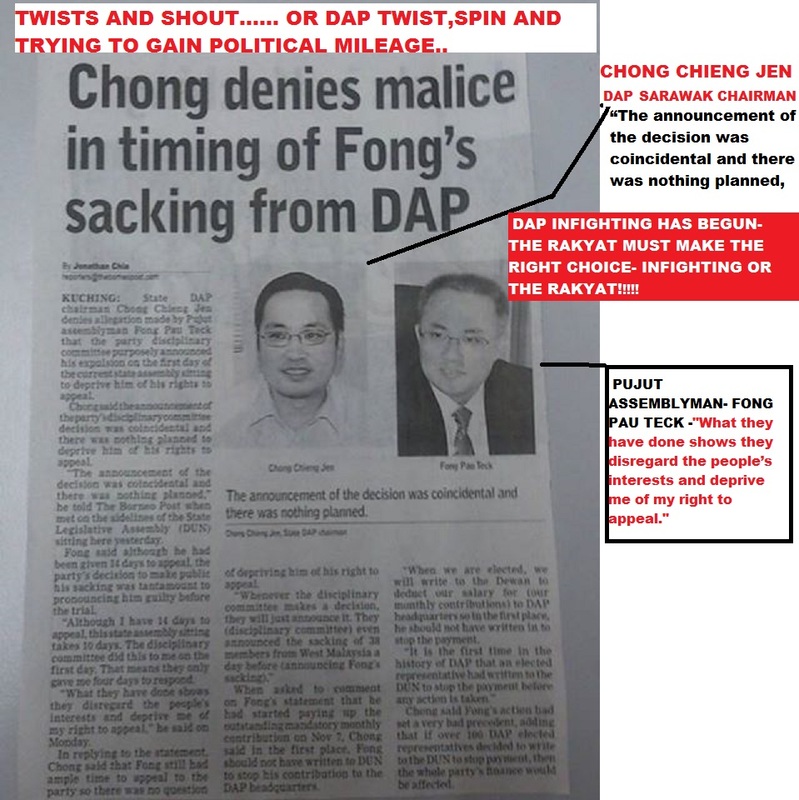 It does seem that the current DAP Chairman YB Chong Chieng Jen has his “pocketfull” eversince he took over the chairmanship from YB Wong Ho Leng. The indications are clear as now the truth is out there and the main stream media is having a field day. They know DAP stories sells like hot cakes and everyday after the DUN sitting the journalists will interview Chong and Fong separately. The RAKYAT and the voting public are watching how this UNFOLDS and if anything they will require a stable party to look after them and also to voice their concerns in the State assembly. In-fighting YBs are of no use to the RAKYAT. The challenge is there for all to see. 5 new political parties approved to Sarawak and the overcrowding political scene is not a matter of choice for the people but something looms behind. PBB and other Sarawak political leaders plus political watchers will say it will not happen as long as Taib Mahmud is still the Chief Minister of Sarawak. True to a certain extend but many UMNO 2nd echelon leaders thinks otherwise. What is so special with Sarawak that it holds UMNO with both hands? 25 seats won out of 31 in the last GE13 and a shift to the otherside will see a crumble of BN. Please this is an “old tell tale story” cooked up which has been past down for 30 years. A veteran journalist said to me sounding very arrogantly “I dont need to belong to a party to know whats going on inside” Of course he has every right to say that and its only his very own opinion. We can rant and shout and tell him he knows “nuts” but is it worth it ? Why should we as politicians give him the benefit of doubt. Politics is about Perception and every party have their ways and means to run their own party. It is up to the Leadership to maintain its grip on the coalition it aligns itself with be it Pakatan or BN. Some parties are still outside the 2 party system and they too know how to ensure that their seats remains intact in every elections. There are various columns written by journalists,columnists and so called political experts/analysis and mosts of it is obviously given by insider sources and those who wants the news to spread like wildfire be it truth or rumours. The writer here audie61 have sat in the Supreme Council of PRS from 2004-2008 and is still a Divisional chairman of BN/SPDP and when we are given a run down by our so called experts on our party and BN in general it does hurt. 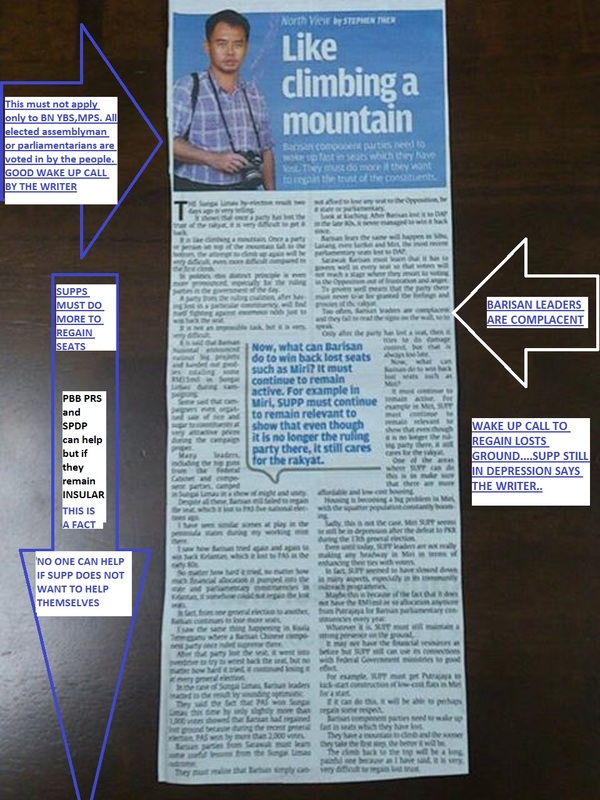 BN Sarawak knows their weaknesses and they try to assist the parties in trouble but only if they are willing to LISTEN AND NEEDS HELP. Parties are all govern by Societies Act 1966 and their constitution and its up to the parties and in this instant SUPP to sort themselves out. Many political careers are made and losts by wrong decisions or for YBs/MPs when they losts in elections. The point for journalists/writers they can write until they are satisfied but to politicians they have to pick up and have another go or sail into the sunset.